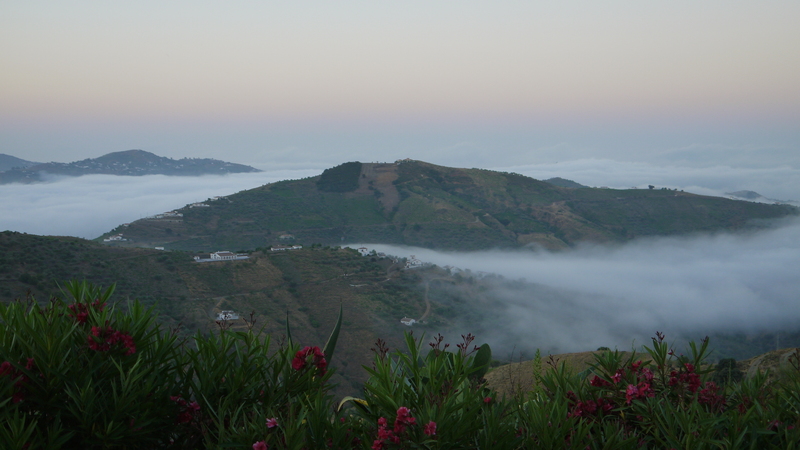 You’d never believe it was autumn here, apart from the sea mist rolling in at dawn like some damp and squidgy duvet. 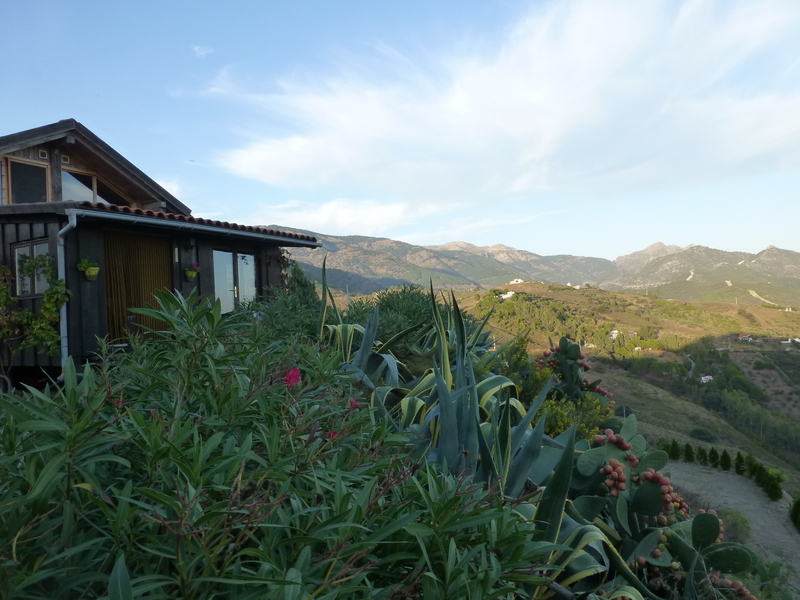 Joe set out to do some routine pruning of the agaves, the pittas (prickly pears) and the oleander hedge that separates the cabin from these gel-filled monsters. 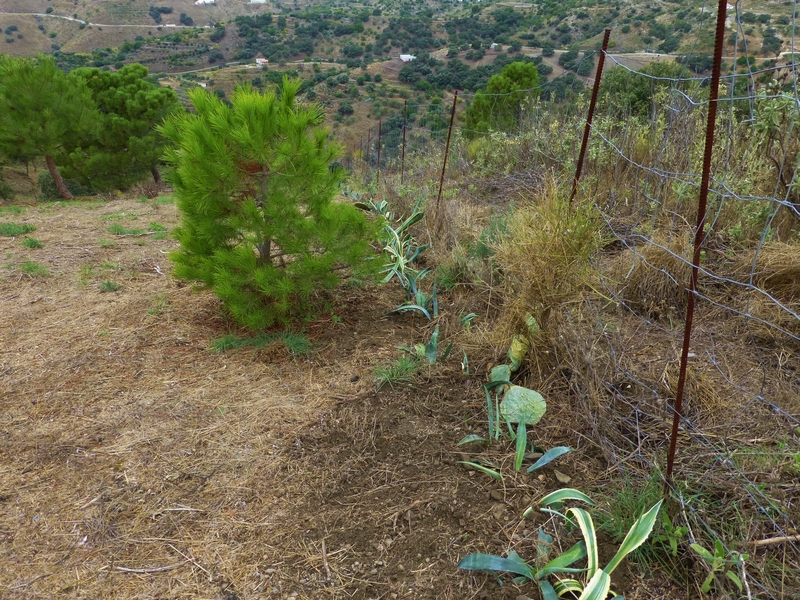 We did have a track just below the oleanders bordered by a low stone wall, but the exponential growth of these plants made it impenetrable for all of last year, and of course, this year. Something had to be done so Joe decided to make a start yesterday on the Pruning Process but had to ration himself – not just because it is very tough work indeed, but also that the temperature is still around the 34 deg C mark. 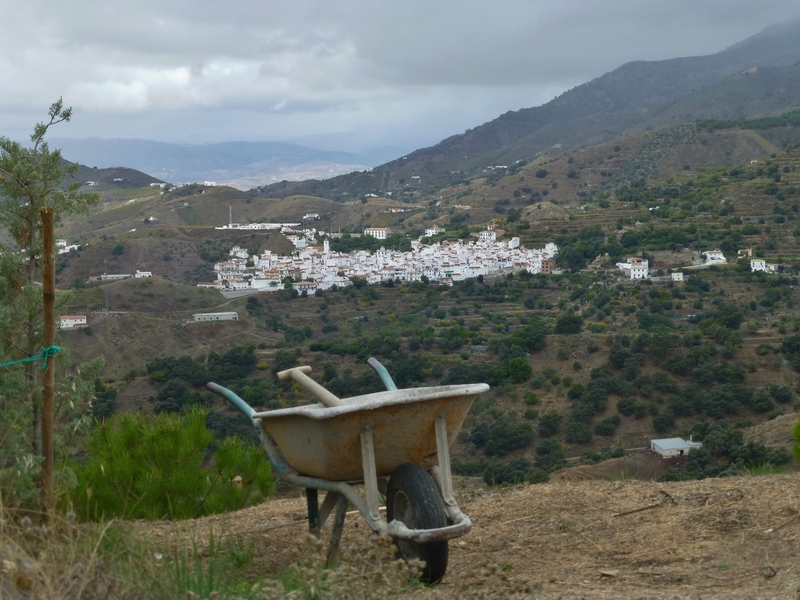 He bought a strange Spanish type long-handled tool, something that we hadn’t seen the like of in England, and spent a little time making it razor sharp. It’s basically like an extended right-angled billhook that makes short work of slashing. It’ll take years for the agave leaves to firstly, lose their moisture, then decompose. Danger lurks if you don’t get it right. 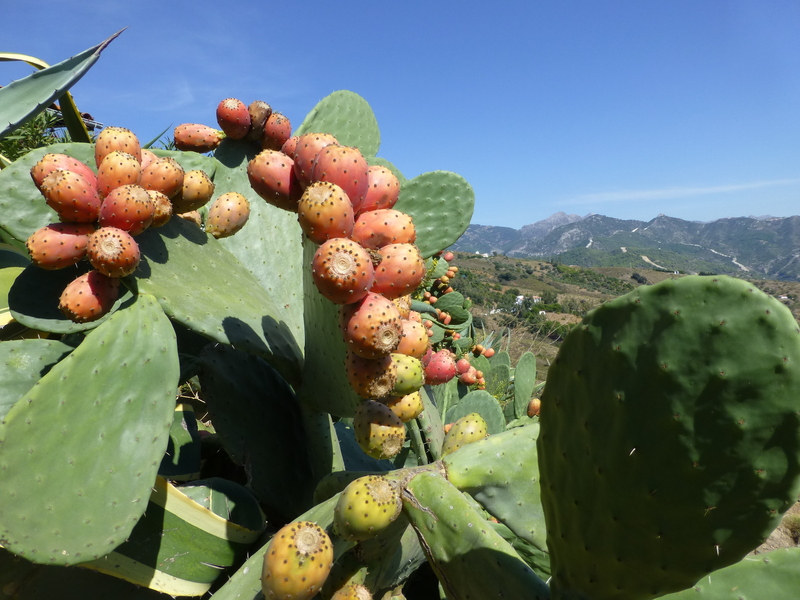 The pittas, or prickly pears, have thousands of tiny sharp hairy prickles and woe betide you if you brush against one. I remember spending a few hours armed with a pair of tweezers removing prickle after prickle from about Joe’s person. Goats and locals alike seem to enjoy the odd munch on the pears. Also, the agaves have deadly spikes and once, just once, Joe got scratched on the leg. Within 5 minutes an awful rash had developed, the pain became intense and he went into some sort of feverish shock state. Quick thinking (for once), I got a pile of ice and quietened it down. Never again, he said. Both plants are most necessary for us to make friends with and cultivate. Why? Well, we are metres from the boundary of the Parque Natural and a raging forest fire would wipe out a ‘solid’ house and make short work of a little wooden one. 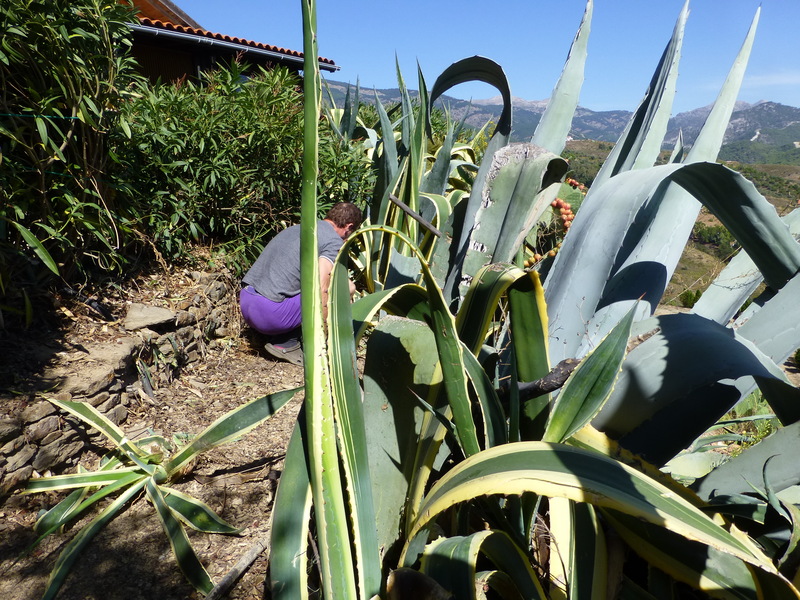 Agaves and pittas are so full of liquid and fibres that each leaf is impossibly heavy and virtually impossible to ignite. Therefore, we encourage our friendly monsters. 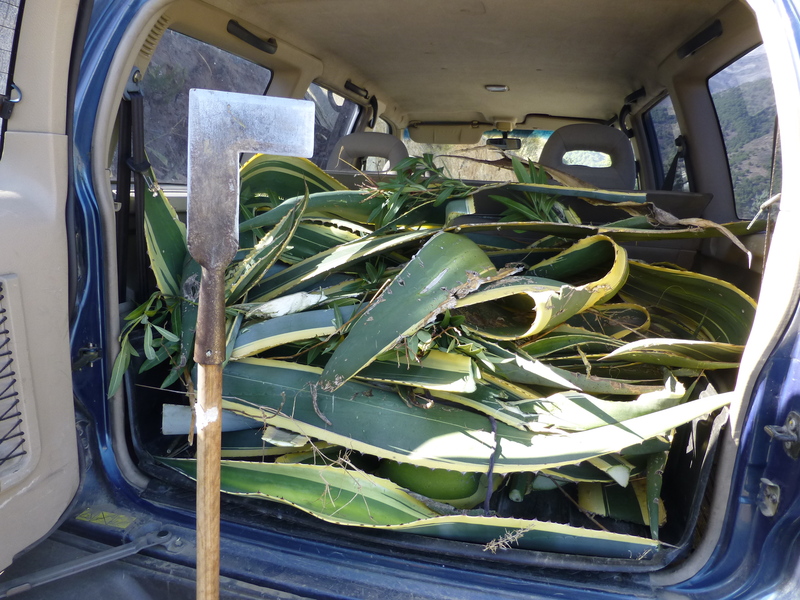 The agaves are most prolific, throwing out roots that soon become young baby plants. We just hack them off and replant them with their roots along our perimeter fence which is no mean feat as we have rather a lot of perimeter, also that the ground is usually rock hard, and for most of the year it’s too bloody hot to enjoy all but the most basic gardening. Autumn and winter are the best times for this work and within a few years the babies will act as a half-decent fire deterrent. Pittas look like teddy bear ears, but a lot less cuddly. All we do it cut the odd ear off and plant it in the ground. Happy landings for an inquisitive intruder! He certainly did (this time)!